December is a very busy time as a professional magician with three weeks crammed full of performing magic at Christmas parties. Most of these parties require close-up magic where I mingle with guests in a drinks reception or around the dining tables, and commonly a combination of both. Another great addition is my after dinner cabaret show – though in December that can regularly be an after lunch show. Although I regularly perform just the cabaret, in December the combination of both close-up magic and mind-reading cabaret complement each other very well. The close-up magic enables me to mingle with the guests, get to know them, learn their names and ensure that everyone is involved in seeing magic happen right in front of their eyes. My cabaret show focuses on the mental/psychological aspect of my performance repertoire, and because I’ve already got rapport with the audience it works really well – a great advantage as my show features a lot of interaction with the audience, and all are randomly selected. I was booked by the West Berkshire Ramblers for their Christmas party in Newbury. It was a very informal function (though for me that means I just take my tie off 😉 ), and the food was a buffet organised by the members. I mixed around the tables, avoiding those that were eating or just getting called up for their turn to fill their plates. With five tables I managed to do a few laps of the room, though I always try and criss-cross, not just work round in a predictable clockwise circle. Thank you so much for bringing your unique brand of entertainment to our annual Christmas party. In the past we’ve tended to provide our own entertainment but you’ve completely wrecked that! Your lively, funny and non-stop patter coupled with your energy made the evening go far too quickly. And as for your magic tricks and mind-reading, Richard’s (not me, the other one!) comment at the end of the evening said it all “I know it’s a trick but for the life of me I can’t see how it was done”. Once again, thank you so much for such an entertaining evening. Another Christmas party was a group that I had been to recently, in Odiham, Hampshire. I went down so well at the September meeting (you can read about it here) with people talking about it at further meetings, that Shirley couldn’t resist the urge to book me again for the Christmas meeting. Fortunately I didn’t get through all my material as last time I also did a cabaret show, show it was a great opportunity to do some material that doesn’t get used quite so much. Not only did the magic and show go down well (again! ), but I also was given a Christmas present from Shirley; and I also won a bottle in the raffle! The following day Shirley sent me an email to thank me. Thank you so very much for agreeing to entertain us again yesterday. You cause a happy buzz around the group which is so lovely, they so enjoy your time with us. I love to see the joy on their faces & their enjoyment is plain to see. You are quite literally magic….you have a wide fan base at the lunch club, let’s hope circumstances allow us to work in another visit at some time. Thank you for helping to clear the room too….above & beyond but much appreciated. Best wishes for a happy Christmas to you & yours Robert, and thank you for making our Christmas lunch truly memorable for all the right reasons. 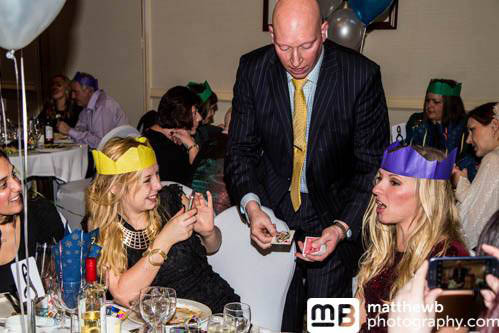 If you are organising a party and want to find out more about my packages of close-up magic and mind-reading cabaret please drop me an email (robert@robertbone.co.uk) or complete the quote request form and I’ll get back to you as soon as I can.